BERHALTER is presenting a patented technology at Labelexpo Europe exclusively to cut in-mould labels and polyester labels. BERHALTER is presenting the new die-cutting tool concept for in-mould labels (IML) and polyester labels that offers the advantages of favourable tool cost in combination with short lead times. The BERHALTER LABEL-light™ punching tool is a patented concept combining the improvements of the flat-bed die-cutting such as unique print-to-die registration and perfect handling properties. The costs for a LABEL-light™ punching tool is up to 70% lower compared with a traditional punching tool even allowing a label contour correction of +/- 0.5mm. Further, there is no need for re-grinding a LABEL-light™ tool, the cutting components can be easily exchanged by the operators in order to continue production immediately. The machine model predestined at our booth E41, hall 5 during the Label Expo Europe is the BERHALTER B 500 high-performance die-cutting machine equipped for IML production. With eight synchronised but separately and individually controlled servo drives. The B 500 sets new standards in high-precision print-to-die registration. The foil tension is fully automatically monitored and regulated. This means that exactly the same die-cutting conditions are maintained throughout the die-cutting process, irrespective how well the reel is wound. The result is precise dimensional accuracy of the in-mould label, which is crucial for the faultless functioning of the feed and injection-moulding systems, as well as for the attractiveness of the end product. As materials become more complex and more sensitive, and quality demands grow stricter, a perfect interplay between die-cutting machines and die-cutting tools is more important than ever before. Reducing cost means also using thinner in-mould labelling films. BERHALTER aims to be the leading company worldwide by die-cutting and processing IML labels as thin as 40µ and even thinner films. Other important aspects include the stack accuracy of labels as well as the static charge on plastic films. BERHALTER die-cutting machines are characterized for their non-contact die-cutting process, which is ideal for the avoidance of static charges. Additional anti-static devices are included in the die-cutting process in order to guarantee the greatest possible process security. Additional operations, such as the finishing of a surface texture, the insertion of a micro-perforation (for applications in the deep-drawn/blow-moulding area), pre-cut holes (for injection nozzles) or die-cut holes for technical functions (centering aids, windows) are very easy to achieve on BERHALTER die-cutting systems. 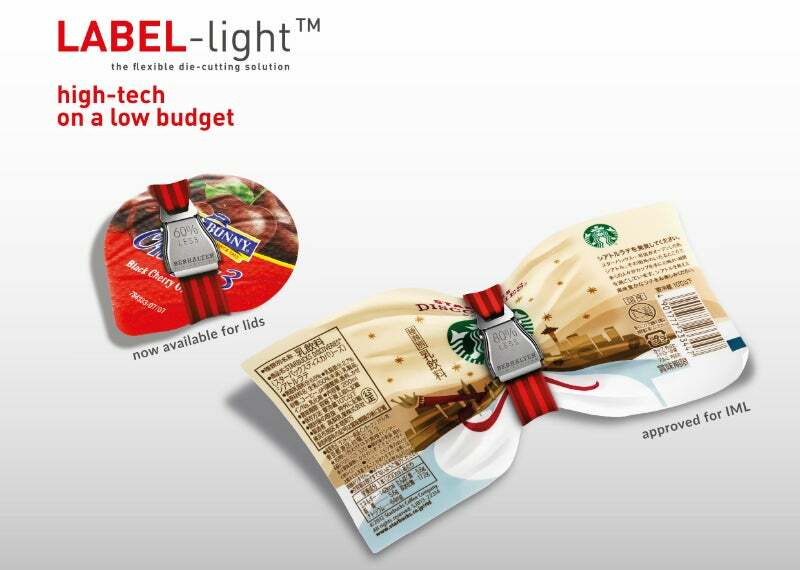 Using the BERHALTER die-cutting system, it is possible to realise any marketing solution without having to impose restrictions in terms of the choice and design of the packaging. For us in-mould labelling is not a temporary fashion, but the result of continuous development for almost 25 years. BERHALTER is known worldwide for flexible, efficient and innovative die-cutting solutions. 55 years of experience and continuous quality development have allowed us to grow into a dynamic company in the packaging materials industry. Our systems are tuned precisely to the production needs of our customers. Nevertheless, the BERHALTER flexible modular construction system allows for individual adjustments to existing or new production concepts at any time. BERHALTER is Swiss and stands for the highest level of quality. With inspiration, passion and fascination, we create top-class quality products. Nothing is more convincing than one’s own experience. We would like to welcome you as a guest with our values, care for you as a satisfied customer and win you over as a friend. Labelexpo Europe takes place on 25-28 September at Brussels Expo, Belgium. Come and visit us at Hall 5 E41.